An old-world street in London, with half-timbered houses overhanging narrow streets and alleys. 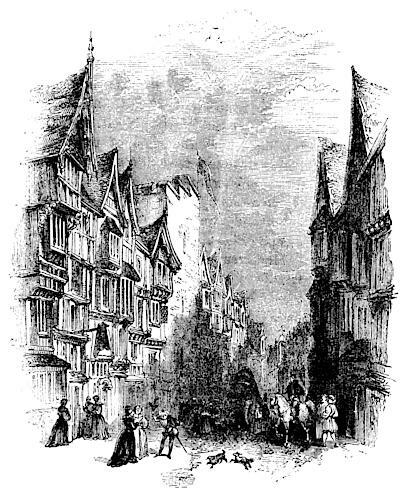 Old London Bridge (Fig. 2090) has been already described; it will be sufficient to say of Barbican (Fig. 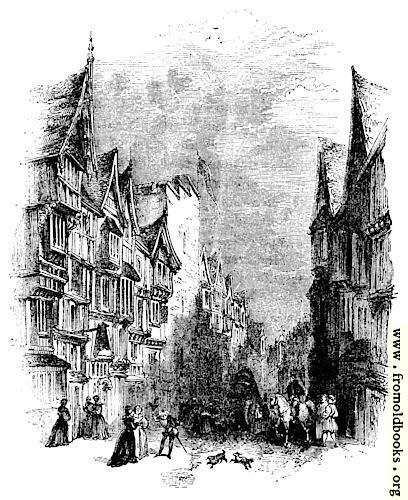 2089) (so called from the watch-tower, that stood here in connection with the original fortifications of London), that it formed, during the seventeenth century, one of the spots favoured by the nobility as places of residence. Here, for instance, was the house (Fig. 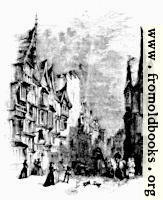 1897) of Prince Rupert, or, as the people would have it, Prince Robber; the nephew and favoured officer of Charles I. Having had occasion, in a previous chapter, to say much with regard to the evil parts of the life and character of Charles’s son and successor, the “Merry Monarch,” it is but just, as well as agreeable, to add here a notice of one act of his reign that may serve, in a slight degree, as a counterpoise:—he founded Chelsea Hospital (Fig. 1997).